You have added Tia Embroidered Maxi Dress in Burgundy/Black into shopping cart. This lovely maxi dress features bold embroidered and embellished details at the bust. The Tia Embroidered Maxi Dress is fully lined. It has a strapless neckline, lightly padded bust, and an empire waist. The contrasting skirt has a full length maxi cut and is made of chiffon. The best part of this dress has to be the multi-colored embroidered designs at the bust as well as the bead embellishments. An exposed back zipper completes this dress. 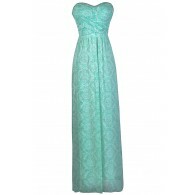 The Tia Embroidered Maxi Dress is perfect for your next formal event. It can also be dressed down for a more casual bohemian style. Pair it with strappy heels or metallic flats for a chic look. Details: Fully lined. Lightly padded bust. Exposed back zipper. 100% polyester. Dry clean only. Small measurements: Length from top of bust to hemline: 51". Bust: 32". You have added Tia Embroidered Maxi Dress in Burgundy/Black into Wishlist. You have added Tia Embroidered Maxi Dress in Burgundy/Black for Stock Notification. You have set Tia Embroidered Maxi Dress in Burgundy/Black as a loved product. 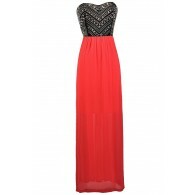 You have removed Tia Embroidered Maxi Dress in Burgundy/Black as a loved product.